How can an art director pick me if I haven't put my foot in the game yet? I'm terrible at sending out promotional materials. I don't know why I procrastinate, but no more. This next month is going to be all about self-promotion. I have my dummy book that is looking pretty good, I hope to have it done before Monday. 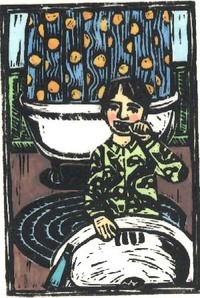 I'm going to use the snorkel image for postcards to send out and I have my ever growing list that I've been compiling. I'm also going to be a better boss this month and keep track of how many hours I'm spending doing each task. I waste too much time, so I'm going to fill out in my planner what I actually work on each day. Hopefully that will shame me into working harder! Study the market. Know that you are in competition internationally for jobs, see what the rest of the world is doing. Keep learning and be realistic about your competition. Are you putting out your best work? My new banner was inspired by my first snorkeling experience. You can see me in the photo. We snorkeled on the beach in Cozumel, Mexico. I wasn't planning on snorkeling, the idea of getting into the ocean terrified me. I'm not a great swimmer. But I finally agreed. It was so scary trying to get into the water, the waves were really crashing against the little stairs where you entered. But once I was out in the water, it was so amazing. We were floating above a beautiful coral reef. Filled with fish, coral and huge sponges. I would love to do it again. I tried to take mental pictures, everything was so inspiring. The colors and textures of the coral, the fish that were everywhere, it went by so quickly, but will stay in my memory forever. Don't let fear hold you back from exploring the world or taking chances, you won't regret it! At the conference the editor-at-large from Penguin suggested we deconstruct other picture books to use as a template and to see how other artist have shaped the composition and structure of their books. Not to copy, of course, but to learn. I so, so love this idea. And plan on doing it as my homework for this weekend. I'm going to plop myself down in the children's section at Barne's & Nobles and figure out what makes those Caldecott books so amazing! I have a template that I'm going to use and just quickly sketch out the composition of each page. I'll probably only do two or three books while I'm there, but I'd like to do a few each week for practice. If you want a copy of my thumbnail template, I'll be glad to email one to you. It's a microsoft word doc. and I just couldn't figure out to put it on the web! Pull the reader in at the beginning of the book, start with the endpapers and the title page, set the stage. Some questions to ask yourself when you are starting to create your dummy. Your characters are moving their way through the story, and they should do so according to the personality you've created for them. These are all aspects of illustrating a book that go beyond what is written by the author. You are telling the other half of the story. Here are some links to thumbnail sketches that I found interesting. Round is a Moon Cake, Illustrated by Grace Lin. While updating and getting my portfolio ready for the conference, I noticed how important it is to edit out my weaker pieces. As I looked through my portfolio, I felt like it had some good pieces and some mediocre works. I was having a hard deciding what should stay and which images needed to retire, which ones I had outgrown. As I striped away a lesser piece, it was immediately evident that it didn't fit. I paired down, to what I felt were the strongest illustrations. My portfolio was no longer a mix of hits and near misses, but the strongest work that I had created over the last two years. Here is my online portfolio. Although you've probably already seen it! Now that I can compare and contrast my work in that collection, I can see what I need to strengthen. What I'd like to add and what to improve. If I had held onto those other pieces, I wouldn't have had the insight to move beyond where I am now and what steps I need to take next. I think it is a never-ending process, if I'm creating, I'm growing and hopeful producing better work. I've heard a study sited many times about two groups of art students. The first were given the whole semester to create one masterpiece, the second were told they would be graded on the quantity, not the quality of their work. At the end of the semester the greater work always came from the students who were graded on quantity. In moving forward and constantly creating, they had grown as artists and produced stronger work. Not every piece will be my best, but if I create enough work, I will hit upon a few gems along the way. The maturity comes in knowing which pieces to count as studies and which ones to put in my portfolio. 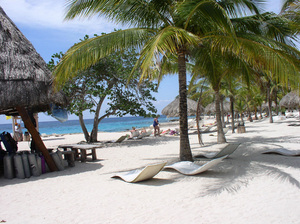 The photo is from the beach in Cozumel, Mexico. I love the winding shoreline, it reminds me of how I work, going back and forth over ideas, until I'm ready to move ahead. Meandering along the path before me, searching out who I am. I thought I'd share my earlier artwork with you, talk about how my work has progressed and I how I "found" my style. click on any of the pictures to see them better. I studied art at Kendall College of Art & Design and got my B.F.A. in 1996. It was a great school. I had 2 years of basic art and design classes that I'm so thankful for, that included 2 years of drawing, life drawing, color, 2-d design and perspective drawing, to name a few. In my junior year I started moving toward abstraction and worked in large modernist color fields. Which is such a far cry from where I am today. Color and texture have spilt over from those early paintings. After graduation, painting and I had a falling out. I lost all interest in fine art and went into bead and jewelry design. Here are two little birds I drew the summer before I started putting my illustration portfolio together. Color and texture are still there. I did a small series of drawings with houses, fruits and birds as my motifs. I'll probably revisit these things later when I'm ready to draw again for myself. But I'm not there yet, still bitter over my fine art break up! I explored different mediums when I first started putting my portfolio together. I tried colored pencils, oil pastels, and acrylics. I stayed with the acrylics for sometime, trying to explore what we could do together. I liked mixing up the color palettes and the opaque layering that I could do, but every painting was a fight and I seemed to be on the losing end. Still, I put together a portfolio, with my best work at the time and went to my first conference and starting submitting. I was struggling with figure drawing, I felt like I was starting completely over. A few things I was learning along the way: I liked quirky characters, flattening space and abstracting my figures and I wasn't into drawing animals! I didn't hate these first pieces, they just didn't feel like me, I was trying to be what I thought an illustrator was supposed to be. I then ran across Mary Azarian's Snowflake Bentley and then My Friend Rabbit by Eric Rohmann. There was just something so appealing to me about their images. I love the repetitive hands-on idea of carving out printing blocks. 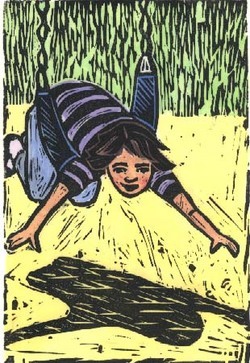 I had taken 3 printmaking classes in art school and had always loved the process. 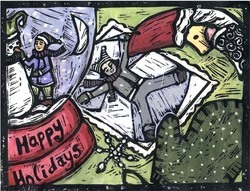 So I dug out my old speedball carving set and bought some linoleum and ink and made this piece. I immediately loved the patterns, the little bits that print out unexpectedly, this felt like a challenge and my little art brain just leapt for joy. I immediately set out to put together a little portfolio of block prints. They were very crude and folksy, but there was something there. Here is another earlier print. I was just starting out and had such a long way to go, but I knew I was on the right path. After a few months, the paintings were pushed to the side, I tried scratchboard for while too, but printmaking was where my heart was at. I started exploring printing on vellum and handcoloring them on the back. Still using the acrylics for color. That led into coloring with oil pastels on the back and experimenting with textures, scraping and layering the colors. Here you can see where I revisited an early idea, my character still popping up here and there. In case you are wondering, that's my youngest daughter. All the early works were valid explorations of who I was as an artist, and each step led me closer to what I really wanted to do. My style is in fact, me, there is no mystery to it, it is the essence of who I am translated into my images. I've learned to edit along the way, weeding out things I was sentimentally attached to, making sure to show my best work in the illustration world. You are going to find your style in what you are most excited about, your style will shine through on the work you are most genuine with. Now within your style, you'll have a range of what you do, not every picture will be the same. But your voice should be unmistakable. In the world of children's book illustrators it is advised to pick one style, one voice and do your best work. And basically that means, your work should be uniquely yours, shaped by the world and the market, but filter through who you are. Get inspired, be creative, read avidly, study every artist who interests you, learn from the masters, discover who you are, take the time, it will be well invested. Tomorrow I will talk about editing your work to refine your style. How do you stand out in the sea of illustration samples that pass over an art director's desk everyday? 1. Talent. Above all they are looking for a unique, strong identifiable style. 2. Content vs. Illustration Style. Your style has to match the content of the writing for the project they are matching up. 3. Looking for illustrations that match the target age group of the manuscript. How do art directors find new work? File cabinets of samples that they keep. Internet - amazon.com, theispot.com and reps. websites. Sourcebooks, although not as much now that the internet is here, and bookstores. They are more likely to work with an artist that has a rep, than one that doesn't. Tips on what to send - postcards 4 x 6 are fine. Any postcard is preferred, if they want more samples they will call you or check out your portfolio online. They are more interested in the quality of your work, than the quality of the postcard. Art directors are under time and space constraints. The often have two boxes when they open their mail, one box is what they are keeping, the other is the trash can. Do your homework, send to the appropriate houses. Find out what each house is looking for, by seeing what they are putting out into the market. You have to become a little bit of a sleuth to find out what the art directors are looking for. Send your very best work and keep evolving to stay current in your style. Tomorrow I'm going to write about what was said about finding your style and why that is important. 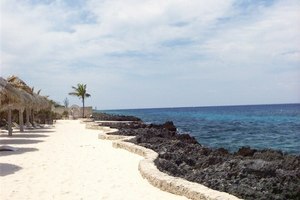 The photo is the beach on Cozumel, where I went snorkeling! Thanks Priscilla! Mulling over my portfolio reviews today, I thought I'd share how they went. Nice comments from the AD from Simon & Schuster: She felt I had a strong portfolio with a very unique style. She said my work was ready and encouraged me to start looking for a rep and to keep submitting. I can't tell you how much the validation of a New York art director meant to me. Like, yes, I can do this. The editor from Penguin & Putnam, said the same things pretty much. Loved my work, had a strong style, loved my camp piece the best. Enjoyed the edge that my characters had and said to dump the animals. Submit to all the major publishers and to send postcards to the art directors. She felt a new illustrator had a better chance getting in, by sending to the ADs. I thought that was very interesting. I have so much more to share with you, stay tuned! I learned new things and deepened my understanding of the basics in the workshops and in talking wtih the editor, art director, the published writers and illustrators. I've taken lots of notes and will share with you some of the things I've taken to heart this week. So check back every day for more info. I'd also like to encourage you, if you are interested in writing or illustrating for children, join the SCBWI. It is worth every penny! I was able to spend a lot of time on the cruise with the National Illustrator Coordinator for the SCBWI, Priscilla Burris, who is as sweet and funny as she is talented. I'll leave you with a quote from her that has changed my whole way of thinking about illustration, "Make your work multi-layered, more than just the text. You are only half done if you just illustrate what was written." We tell the rest of the story with pictures. Bringing characters to life, creating worlds and bringing deeper meaning to the story. She is brilliant! -the image is sugar starfish, sea urchins and spikey urchins that I found in a gift shop in one of the ports. They reminded me of beads. For a moment it made me want to decorate my entire house with a mermaid twist, but I calmed down and picked these up to display in a silver bowl that I have. They may just inspire a bead or two. Okay, I was doodling around what I wanted to pack for the cruise. Tomorrow I have quite a list of things to finish. But it's manageable. I'm so excited I can hardly stand it. My critique session has 3 other illustrators and the art director from a major publishing house as the workshop leader. There is also a portfolio display and 3 days of workshops. But it's not all work, we are on cruise ship after all. I don't think I'll sleep the entire time, there is just too much to see and do and I can't wait for a vacation. My friend Angela is an incredibly talented clothing designer. She is a big inspiration to me. Most of my clothes are from her collection! She is finishing up a super cute pink skirt for me, along with a sheer tank top that crosses over in the front and has a wonderful graphic cream colored flower print. I can't wait to get them tomorrow. I bought a sarong today and yet another pair of sandals. My mom will think that's funny, since I spent time buying sandals this weekend. They are super comfy. That's what I was searching for. Now I'm ready for lots of walking. I'm hoping to visit some Mayan Ruins in Mexico. I'm taking my camera and sketchbook, so I'll have lots to report back next week. Until then, happy creating! This had me thinking of pulling out my oil pastels and making some little abstract drawings for the pendants. So here they are, I'm so in love with them! I used my oil pastels & graphite on vellum, they are collages, with lots of layers. I love that you can see the drawings on both sides of the paper. Since the pendants are covered in glass on both sides, the light shines through and the images have a nice depth. The top image is the entire necklace, here is the other side of the pendant. This is the second pendant that I made. I should say we, because I did the drawing and my Mom put it together with the copper tape and soldered the silver color on there. So she did most of the work. I strung them with a hodge podge of beads in a 16 inch choker, the pendant is 2 inches long. Very modern. The other side of the second pendant.